Safari in iOS has always had the ability to clear all browser history on the iPhone and iPad, but up until the latest versions of iOS, it was either delete all history or nothing. That has changed however, and if you would rather selectively delete individual pages from history instead of clearing out all browser history from Safari, you can now choose to do that easily. This is useful in many situations, whether you forgot to enter into Privacy Mode in iOS Safari, want to cover your tracks when trying to surprise someone, or just want to delete an embarrassing page or two that you happened to visit on your iPhone or iPad. The page title and URL magically disappears from Safari History, as if it was never visited. Note that you must be in the bookmarks History view described here, as the ability to remove pages from history does not work in the Back Button history view. The swipe-left-to-delete gesture is nearly universal in Apple iOS apps, from Mail to Messages, so it’s a good trick to remember in general. If you find yourself constantly deleting pages from your history, you can also prevent pages from being stored in history altogether by using Private Browsing mode in Safari, which won’t store any local browsing data on the iPhone, iPad, or iPod touch. 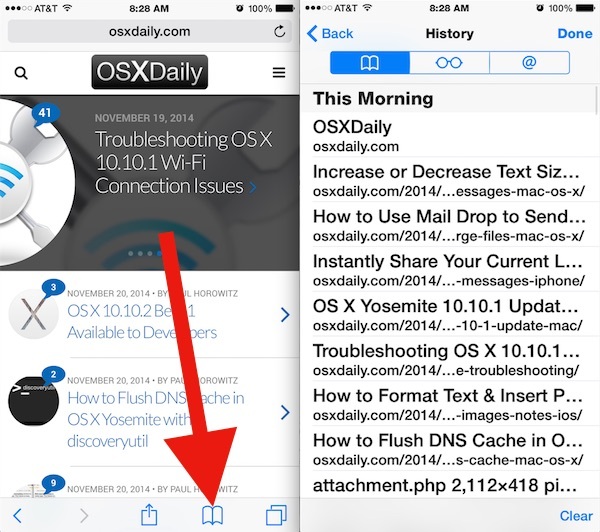 Similarly, you can choose to clear specific cookies for websites in Safari for iOS as well. 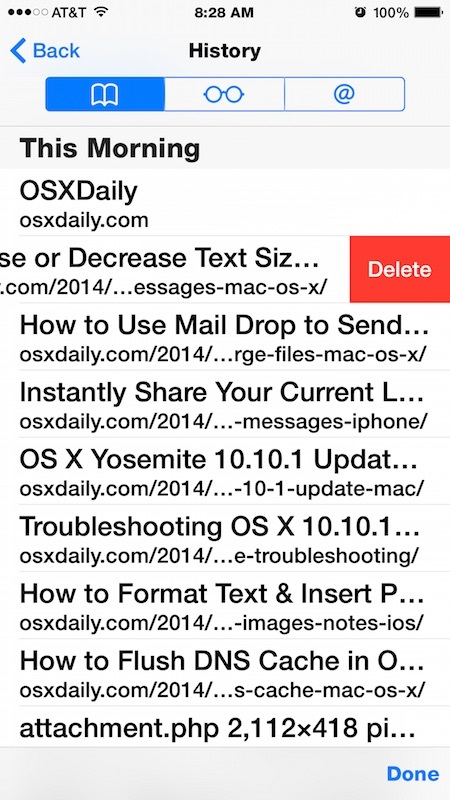 Now you know how to remove specific history from Safari on an iPhone or iPad. If you know of another method to accomplish this task, or a similar solution, feel free to share with us in the comments below! This does not work on the ipad. Please provide same info for Mac Yosemite! Apple took away the ability to delete individual cookies. They make me delete history AND web data, which logs me out of some current websites. Separate topic: Please tell us how to get back OS 10.9 bookmark dropdown menus, if possible. Clicking in the text pane to get folder icons, then having to click my way through other folders (with names not fully shown) is highly annoying. Apple seems to be changing stuff just because it can, based on how it looks rather than how it works.